I gave you a dough recipe with instructions for making deep dish pizza. Here’s my latest version with minor adjustments. If you try it, please let me know how it turned out (and take photos). DD101: EXTRA – Always Room For Improvement 2 (Electric Pizzaloo), which has a recipe update and some additional info. 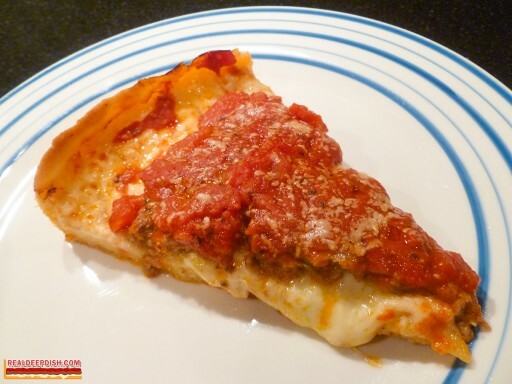 GREAT recipes ideas and tips for a truly authentic Chicago-style deep dish pie. We are planning to make a large batch of dough for a dozen 15 pizzas at once at a retirement home in Wisconsin. Since our Hobart dough mixer will only handle a minimum of 25 lbs. of flour (one bag of H & R bleached flour), can you please specify the perfect proofing procedure for a bulk batch, i.e. mixing time, first rising time in a lined bucket. punch-down (if any), the maximum refrigeration hold time permissable and the second rising time before baking? Also, what temperature should be used for a commercial deck gas baking oven? Hi, Caren, and thanks for visiting Real Deep Dish. This website and dough recipe is geared toward the home baker, so I can’t provide “perfect” info for large batch mixing and rising, but it’s likely similar to the small batch info. Hold back a little on the water if you’re scaling the recipe up for 12 pizzas. You may need to mix a little longer to bring together that much dough – long enough until your dough is a bit shaggy and just starting to get smooth. Use instant yeast (red star platinum) if you can find it – you’ll have better results, especially if you’re going to refrigerate your dough. Let your dough rise until it’s doubled in size, about 1 hour to 90 minutes; then use right away or punch down and let it double again. You don’t need to refrigerate your dough for the second rise, but if you do, let it warm up first or you may have varied results. Since you’re making a dozen pizzas, you may expect slight changes from pizza to pizza as the dough gets warmer. I use home ovens in my testing. A commercial deck oven is typically more efficient, so you should be able to bake for a shorter time at a lower temperature – Start at 425 and see how your first pizza looks after 25 to 30 minutes. Cheese pizzas will not take as long to bake as Sausage pizzas. Keep the pepperoni UNDER the sauce. Any veggies should be added about half-way through baking (unless you like to char them). Let the pizzas rest for 5 minutes before serving. Pay attention to how your first batch of pizzas baked, then make adjustments to baking time, sauce amount, etc. Thanks for your recipe. For the past two years I have been working to not only perfect my pies, but also make it a bit unique. I have baked pies for my lodge and co workers. Many have said it was the best pizza they ever had. People at work stop by my desk and place pizza orders for the weekend. My wife was a bit taken back when she came home and saw I ordered pizza boxes off Amazon. Sometimes I still miss the mark with the buttery flavor in the crust. I’m sure I am either using too hot water, kneading to long, over handling or a combination of those. I have thought about eliminating the sugar out of the recipe as well. Any thoughts? If your dough is good except for a lack of buttery notes, I wouldn’t change anything in your method except one thing – Give your dough more time to ferment. If you’re making same day dough with a single rise, punch it down after the first hour, cover again & let it rise another hour, then punch down and rise for 2 more hours covered. That should get you a little closer to those elusive buttery notes. If you’re refrigerating the dough, give it at least 24 hours after your first unrefrigerated rise. Lou Malnati’s says they do 48 hours. I don’t think you really need to go that long. If one of those tips doesn’t help, you can always go with brushing on melted butter right before and after your bake. Thanks for visiting and keep up the pizza baking! Sounds like you’ve got some fans! In 1972 during one of those Uno outings on a cold winter night, I absconded two 14-pans and a metal grabber, hiding them under my heavy parka. Young and foolish, I know, but I still have them today and use them for my pizzas. They are irreplaceable. Reading your instructions I have three suggestions. First, I feel it is always best when using dry yeast for anything to proof it. Mix the yeast into the lukewarm water with some sugar, then let it sit until you see bubbles form on the surface. Then proceed. Second, I go all out to limit the liquid that can accumulate in the pizza. Not only do I carefully drain the plum tomatoes I use (at least a day in a colander in the fridge, stirring occasionally. The juice is great for Bloody Maries); I also render the bulk Italian sausage. Even the restaurant grade stuff will add too much grease during baking if you’re as generous with it as I am. I break my fresh sausage into large chunks and bake them in the oven at 250-degrees for an hour or so in a large tilted cast iron skillet. A lot of fat comes out without overcooking the sausage. Finally, I use whole milk mozzarella in a solid brick I get at Restaurant Depot. I slice it myself on a mandolin, but I also course grate some. (NEVER BUY SLICED OR GRATED CHEESE.) I apply the slices just like you and Malnatti do, but that’s not good enough for me. I sprinkle more grated cheese as I layer the sausage and other ingredients/spices, then top with the prepared tomatoes. 15 minutes before the pizza is done in the oven I sprinkle a little more cheese on the tomatoes just for looks. Thanks for checking out the site and all of your pizza tips! Hi and THANK YOU for sharing this recipe. There’s a pizza restaurant in Platteville, WI called “Pizzeria Uno” and it is NOT part of the Uno Chain. It’s a mom and pop that has been there since the late 1960’s and, IMO, makes the best Chicago Deep Dish pizza in the world. I’ve been trying to duplicate it at home for over 30 years. You provided me with the right crust…almost. I think the rest of the equation is probably pan and commercial oven, as I use a cast iron fry pan. But thank you thank you thank you. A couple tips for you: I use shredded mozzarella that I shred myself. I’m not wild about the quality of ‘name brand’ mozzarella slices, I find better cheese at more locally-oriented cheese makers, like Shullsburg in SW Wisconsin, or Weyauwega up in the East Central part of WI. If I can find it, I like whole milk mozzarella better than skim. Definitely NEVER use pre-shredded Kraft, Sargento, etc. They add sawdust to the cheese. PINE sawdust. I know this for a fact. Look at the bag…that ‘cellulose added’ part? That’s sawdust, one source of which is the Biewer Sawmill in Prentice, WI, which is about 30 miles from Kraft’s big pizza facilities in Medford, WI. I have a cabin near Prentice and buy sawdust from the sawmill myself for a compost toilet at my cabin, but often it’s not available as I’m told it’s sold to Kraft for this purpose. I don’t want sawdust on my pizza, thank you. I’ll take the extra 90 seconds and shred it myself, or slice it, whatever the case may be. You’re commenting on an old post, so some of your comments I’ve talked about before, and I may have added new information in the followup post, DD101: EXTRA – Always Room For Improvement 2 (Electric Pizzaloo), and other posts, like the one I stickied to the top of the homepage. The restaurants in Chicago use sliced whole milk mozzarella and I like it better too, but since it’s not as easy to find it pre-sliced, I tell people to just get the part skim. You can always combine it with provolone slices or some other higher fat cheese if you want, or just find those low moisture whole milk packages like Frigo (Saputo) and slice them yourself. I don’t recall ever recommending shredded cheese for deep dish, but it’s possible to use it if you can’t find sliced. Not all cellulose comes from trees BTW, and it’s not like they’re throwing pine needles and splinters in there, but I’m all for grating or slicing your own cheese if you want to cut back on the anti-caking agent they toss in the processed bags of cheese. My recipe gets you in the ballpark. It’s up to you, if you want, to tweak your “ultimate deep dish dough”. I can’t wait to try out your recipe. After visiting Chicago last fall and LOVING Lou Malnati’s pizza, I’ve tried making my own a few times. (Idaho has lots of NYC style pizza, but only 1 place that serves mediocre deep dish at a whopping $18 for a 10″ cheese.) My own pizza making came out similar, but I wasn’t getting that dreamy butter crust. I think I’ll make one of your pizzas by the recipe, and another with some butter brushed on top of the crust (as you reference above). I’ve been making my pizza in a Wilton 10″ nonstick springform pan, which seems to work well. Are there any good store bought pizza sauces that work well for deep dish? I’m not a big fan of large chunks of tomato on my pizza in the sauce. If you’re not into chunky, try puree instead of crushed. Just make sure to taste it out of the can and adjust seasonings to taste. your main adjustment would be to add sugar or salt until it tastes right to you. I also highly recommend mixing in dried basil (or fresh chopped if you have it) to the tomatoes. Thanks for visiting Real Deep Dish! Couple questions for you if you don’t mind. I just finally got all my needed equipment and will be using your recipe to make my first deep dish this week (finally!). I got one of those new baking steel stones so I’ll let you know how that works out. First, have you tried freezing the dough? Thinking it would be nice to be able to make a double batch at once if it freezes ok.
Second, when draining the tomatoes, do you just let them sit or should I actually push down to force the liquid out? Finally, how is the thin crust recipe coming? I’m looking forward to that one maybe even more than this. From a relocated Chicagolandian in Florida, thanks for this site. It’ll be nice to not have to drive all the way to Orlando just to get Giordanos. I have tried freezing the dough, and it freezes fine in a zip-top bag – spray the inside of the bag with cooking spray & squeeze the air out before you seal it. than it does to just make fresh deep dish pizza dough. You can make deep dish dough in as little as 90 minutes, though I recommend 2-3 hours. It takes 3 to 5 hours to defrost frozen pizza dough. If you’re making extra dough, it will keep in a ziploc bag in the coldest part of your fridge for up to a week – possibly longer; the ziploc may expand, so just check it every other day to let out the gas if the yeast is active. The aged dough will likely have more flavor as well. Crust texture may vary. RE:TOMATOES – You can do either, drain or press, but pressing too hard gets rid of some of the moisture that you want to keep in your tomatoes. If you take out too much water from your tomatoes, your deep dish sauce may end up too dry. Start draining the tomatoes around the last hour of your dough rise – they should be ready to go when your dough is. If your pies are still too watery, consider using less sauce (it could also be other ingredients causing the water/liquid). I have a thin crust dough recipe that works pretty well, but it’s the technical stuff I am still working out. i.e. – Currently, I mix a double batch of thin crust dough by hand and then put it in the stand mixer with the dough hook for 3-5 minutes. It ends up as not quite a ball, but more of a corkscrew shape, but once you get it off the dough hook, you can make it into a ball pretty easily. It should work really well with that baking steel. For thin crust baking temp, try 500 degrees. About 12-15 minutes for a 14″ pizza. Your oven temp and baking time may vary. Speaking of Giordano’s, I suppose you could use a double batch of thin dough to try making a stuffed pizza, but that’s another lesson down the road. Alright, made my first deep dish Thursday night and it turned out pretty well. Crust was a little on the dense/tough side so I may have overworked the dough. Don’t know if it could have made a difference or not, but I had a considerable lapse in time (20 minutes or so) between the yeast dissolving and when I added the flour and oil. I tried to really work the back crust up the side of the pan so it would be nice and high and thin, but it just kept settling back down. Any tips for that? I think next time I will also season things a little more aggressively to suit my tastes, but I didn’t want to stray too far from the recipe being my first time. Also I will either put the pepperoni in the middle or else I will skip the parmesan until after cooking. The parmesan cooked on top of the pepperoni got a little burnt tasting. Overall though, it was a damn good pie, certainly much better than I could have done without this site. Thanks so much, and I’ll be giving the thin crust a shot eventually. Oh, and yes, the baking steel worked great. I think I’m going to increase the hydration slightly on the main dough recipe. I want the dough to have a better chance at elasticity and it seems like 3 times out of 4 for me, the same thing happens with the dough ending up a little tougher than it should be. In my dough-pressing lesson (link below), I was working with a less-than optimal dough, but still managed to get a decent crust. I don’t think waiting 20 minutes on the yeast would have made much of a difference, but overkneading might. As I mentioned above, it might be a slight hydration problem. Try adding 1 or 2 extra tablespoons of lukewarm water next time you make the dough. As for the the crust edges, make sure that, if you’ve greased your pan, you only grease the bottom and NOT THE SIDES. Depending on the temperature and rising/resting stage of your dough, there could be a bit of spring-back, which is normal. You always take a risk when you put ingredients on top of the sauce on a deep dish. You can take out a little insurance with some aluminum foil. If you notice the top of your crust (or your toppings) are starting to get overdone or charred, cover the pizza with a loose sheet of heavy duty aluminum foil while the pizza finishes baking. You can also try “Pizzafying” your oven. And finally, consider lowering the temperature of your oven by 10 degrees and/or baking 5 to 10 minutes less. Everyone’s oven bakes a little differently and you may be baking at too high a temp or for too long. Your pizza is still cooking minutes after you’ve taken it out of the oven, so give it 5 or 10 minutes before cutting into it. I covered with foil about halfway through. I was trying to make sure the pepperoni got crisped, but it ended up browning the parm too much which tends to get a little bitter tasting. I’ll try adding a little extra water to the dough next time. As for the back crust, I may not have been aggressive enough with the pinching/flattening. This might sound strange, but what do you think about adding a little beer to the deep dish dough? Something like a pilsner or a golden ale, not a lot, but maybe a splash or two I would think might add a nice flavor. Back to the thin crust– cook it on a pan/screen or is it better off directly on the stone? I hope I’m not bothering you with all the questions. It’s just that I finally spent the money to get all the needed equipment and pizza-making is new to me (I’m a pretty solid cook but I don’t do much baking other than biscuits.) It’ll be nice to have access to good pizza again. I love Florida but the pizza situation is pretty rough. The alcohol in beer will kill the yeast (even though the yeast is what made it), so be careful if you add any. A better option would be to put your dough in a zip-top bag & into the fridge after the first rise. Leave it in there for 1 to 3 days. You’ll likely get the fermented flavor you’re looking for. For extra flavor, I like to float 1/2 tsp garlic powder (and other herbs/seasonings, like parsley, basil, etc.) on top of the oil for a minute before adding the flour and mixing up the dough. You can also add some dry grated cheese (parmesan/romano) in with the dry ingredients. I’m still testing thin crust. It’s a difficult thing to do at home because you have to roll it out and then keep it from sticking to whatever you’re baking on. A typical wire mesh pizza screen works well (and leaves a nice pattern on the bottom), but can be difficult to master. Make sure to use high heat cooking spray or oil the screen before putting dough on it, and try not to mash the dough into the screen or the crust can get stuck in the screen. If you dock your dough, be careful not to over-perforate the dough, or the sauce can leak through and make the pizza stick to the screen. Put the screen right on top of the preheated stone. I like to remove the pizza from the screen and bake directly on the stone for the last few minutes of baking, but that can sometimes be an acrobatic feat, clamping the screen and using a thin metal peel to move the pizza off screen and onto stone (AKA “decking the pizza”). The perforated cutter pan is nice because it’s a bit easier to work with. Also, it’s a thicker piece of metal than the screen, so it holds on to a little more heat. I still recommend cooking spray before you put dough on it, and decking directly on the stone for the last few minutes is still a good idea. Since there is less airflow compared to the screen, there can be moisture build-up (even with the perforated holes) in the center of the pizza that could crisp up a bit more if you deck the pizza. You can also bake directly on the stone, which means you build your pizza directly on the peel. The issue here is making sure the pizza glides off of your peel, which is very hard to do without a TON of semolina (or flour or -gasp- cornmeal) to work as ball-bearings between the peel and the bottom of your pizza. In a home kitchen, this can turn into a huge mess. Even if you get your pizza to glide well, the toppings can fly off the pizza while you try to get it onto the stone and then smoke happens and smoke alarms go off, etc. It can be done, but like the screen option, it’s a bit of a challenge. So, I guess after that mini-novel, my preference would be perforated cutter pan for Chicago thin crust. It would be the easiest. If you check out my Deep Dish equipment page, there is a “Mega Screen”, which is a sturdier version of the typical pizza screens, and looks very similar to a cutter pan. Also, I just added some “Ultra-Perforated” pans at the bottom of the page. For home use, I’d start with a 14″ size (other sizes are also available), and if you don’t already have one, get one or two of those wide-rim serving pans so you have somewhere to offload your pizzas. p.s. – it’s very likely a lot of this info and advice will end up in my thin crust article. I’ve got one of the perforated pans. I’ve seen sites for NY style that suggest covering your peel with parchment, building the pizza on top, and then sliding the whole thing onto the stone. Then after a couple minutes for the crust to set, you slip the parchment out from underneath. This seems like a much better idea than dumping a ton of flour into the bottom of your oven. They also suggest moving the stone up towards the top of the oven and cooking the pizza under the broiler after preheating. However, Chicago style is so much heavier and more substantial that I’m not sure that would work so well. It would definitely affect the use of raw vs precooked (or at least par-cooked) sausage though. Glad you mentioned that the beer will kill the yeast. That’s why I asked. I don’t know a lot about dough, but I know yeast can be a bit fussy and fragile. That’s why I wondered before if leaving it for so long and the water cooling down could have affected the texture. I’ll try leaving it for a few days next time like you suggest. And again, just in case I haven’t mentioned it enough, this site and your time are really appreciated. Should you ever find yourself around Tampa/Clearwater, you’ve got a couple rounds coming on me. The pizza scene may not be much to brag about, but we’ve got some really good seafood and great breweries in the area. I had a very successful test of the increased hydration dough. It was soft and easy to press out and made an excellent crust. Ok, made attempt number two on Sunday and it turned out amazingly good. It was the same batch of dough as the first time, but this time it had about a week to defrost and hang out in the fridge. That seems to have made a big difference. The crust held its shape but was nice and tender, and I managed to get the back crust to stay up higher. I had to pinch and work it back up the pan several times but eventually it thinned out and stayed put. I added a good sprinkling of dried oregano and basil over the sausage layer. I also hit the tomatoes with a good bit of oregano and basil along with salt and a little sugar. I waited to add the parmesan until the half-way point when I rotated the pizza. I also added the foil shield at that time. The finished product was truly better than I could have hoped for from a homemade deep dish. I would gladly pay for this at a restaurant and be eager to order it again. You, sir, are my savior. In cheeses name, amen. Quick question – I downloaded both documents, the original RDDHolyGrail.pdf and then the RealDeepDish-201211.pdf and they are both exactly the same. Even the byte count and create date/times on both are identical. Can you please check that and confirm which is the latest version. I tried the first version before noting the newer one, and I thought it came out a bit crackery. I thought I would try the new version, but its looks the same? Thanks! The files match because its the latest version that I’ve been happy with, so I updated the main file. Yes, my crust is a bit on the thinner side, so it’s possible that crackery was your result. How long did you let it rise? but it may be less dough than you want. You’ll see the dough weights vary. or increase the hydration slightly (which may require you to also add more flour to compensate). You might also try playing with the Pizzamaking.com deep dish dough calculator. Plug in the bakers percentages, use the numbers from the “pm-dd-dough-calc-TF = 0.14; HFUTS = 0.15in” to start and then increase the TF (thickness factor), try 0.20 instead of 0.14, until you get the amount of dough that works for you. I’ll revisit the recipe the next time I make a deep dish and see if a change in the TF works better for the general population. Thanks alot. I was on PM.com and was comparing this to another one I saw, but without a fancy gram scale, I don’t really know how to compare. Pretty new at this obviously, your yours was a great first start. I think I will try to bump the volume a bit and see what happens. I noted the other one had 354g for a 9″ vs 241g for yours, so there might be something there. I also used a new to me KA stand mixer, and even after 2-3 minutes, the dough had not balled, (lots of little pieces) so I finished by hand. I wonder if I over kneeded it? I did let it rise an hour, punched it down, then gave it another 30 then used it. I’ve got a lot of learning before me! Thanks again for sharing a great recipe! We just opened a restaurant which had pizza.ovens,etc. So, of course we decided to make pizzas. I did not know a good pizza is so hard to make! We finally have a great sauce but we are having problems with our deep dish ,Chicago style pizzas. What can we do to keep the bottom of the pizza from getting overcooked? We have gas powered that cooks around 550. Also your pizza looks great…what kind of cheese do you use and how much? is thereafter way to cut the cooking time from 45 minutes. This is tying up the kitchen and we have had walk outs because the pizza takes so long. Any. Help would be so MUCH appreciated. Hi, Nancy. Thanks for visiting RealDeepDish.com ! I typically use sliced low moisture part skim mozzarella. Sometimes I use a combination of cheeses, including Provolone and Cheddar. Many restaurants use low moisture WHOLE MILK mozzarella. I’ll use whole milk mozz when I can find it. but the recipe on the site does give some suggestions of the brands I’ve researched and/or used. If you can find the 5-lb blocks of ‘Bakers & Chefs’ (aka Stella) Low Moisture Mozzarella, (Sams Clubs carries it sometimes) their Part-Skim is one of the tastiest I’ve tried. I imagine the whole milk version is even better. Sorry to hear about the walk-outs. Authentic Deep Dish Pizza takes time to bake. That’s why at the original Pizzeria Uno in Chicago, they take your pizza order before you even get a table. It’s best to inform your customers that deep dish takes longer to bake than a typical pizza; offer appetizers on your menu so the wait doesn’t seem so long. you probably have to lower your baking temperature and possibly increase baking time so everything gets done at the same time (or you might just be baking your pizzas too long). I can’t tell you how long or what temp because I don’t use a commercial oven at home to test-bake pizzas. My site is geared toward the home-baker, but you may find people in ‘the biz’ who have a lot of the industry answers you’re looking for at Pizzamaking.com in their forums. In a home oven, I bake a 14″ deep dish at 450-460 degrees F for about 35-40 minutes. A 12″ takes about 30-35 min. A 10″ takes about 25-30 min. you might want to try baking a 14″ for about 20-25 minutes and see if everything cooks through. If the crust is ‘on the money’ after 25 minutes, but the rest of the ingredients aren’t (i.e.- cheese and sauce bubbling, sausage cooked to 160-165 for food safety), consider reducing the amount of ingredients you use on your pizzas until they give you the results you’re looking for. Too much sauce? Too much sausage? You’ll have to make some test pizzas. and be prepared to provide details so those guys can help you tweak your deep dish. I throw my 2 cents in from time to time. man i wanna use your recipes, but i dont own a scale and guess im too dumb to figure out what 0.72 or 0.34 of a teaspoon are. Maybe use a 12″ pan instead of the 14″ or call a friend who has a scale or can handle basic mathematics and estimates. Just wanted to thank you… I love this recipe!!!. For the most part, I’ve been doing NY style and napoletana pies. The only deep dish I had ever made before was with grocery store “made fresh daily” dough in a cast iron skillet. They were actually pretty good, though apparently FAR from Chicago style! The only Chicago style restaurant pie I had ever had before was from my local UNO’s… in Connecticut (now closed). In other words, I have never had a REAL Chicago pie. A week or two ago, I came across realdeepdish.com and decided to try your recipe. Whole different animal! And so quick and easy!! I love the fact that you can decide to have pizza and a couple of hours later, it’s ready to eat!! I’ve done two of these so far. The first was baked in my Big Green Egg, the second in my electric oven (center rack on pizza stone). The egged crust was better, but not by much. Both were very flaky and delicious! Perhaps the best tasting pies I’ve ever done! From the photos I’ve seen, your recipe appears to be most like Malnati’s, yes? Oh, one other question… have you ever tried putting melted butter in the pan before the dough? I used corn oil in the pan, but butter sounds good, unless it will burn. Or maybe some butter chunks mixed in with the dough like you would with a standard pie crust? And a little less oil to compensate? Thanks very much for putting this out there! I would have included a photo, but apparently I cannot. You’re very welcome! 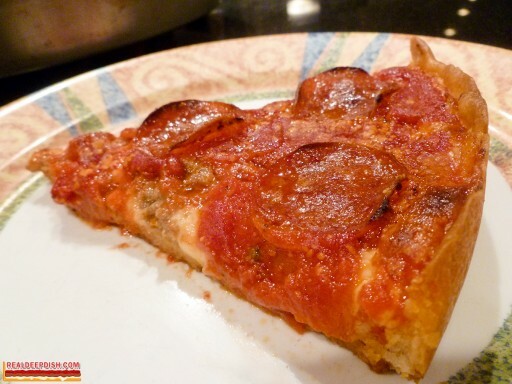 I’m so glad my site could help you make better deep dish pizza! then yes, you had not previously had Chicago Deep Dish. my crusts are a bit thinner than, but similar to both Pizzeria Uno (the original) and Malnati’s. I just put up a new post about ‘Pizzafying’ your oven. It may help you get better results. One of the important steps when using a pizza stone is to preheat that stone. I recommend at least an hour, but you might get away with 30 minutes. I haven’t baked a deep dish pizza in a bbq grill yet. I’d be concerned about burning the bottom. What was your Green Egg configuration? Did you use indirect heat? Any extra protection, like a sheet pan below your pizza pan? Butter has stuff in it that will get brown and eventually burn if cooked too long. You will probably be OK using it, but if you can find (or make) clarified butter, you will have less chance of burning. As for ‘butter crust’ that Malnati’s offers, they’re brushing the TOP of the dough with melted butter (possibly margarine -TRANS-FATS- Run away!) before they add cheese and toppings. You can definitely use melted butter in place of some of the oil in your dough (or you could do the cold butter pie crust thing, but keep in mind that butter also contains water, so it may throw off the recipe if you don’t also compensate for that. Maybe a few tablespoons less of water. Well, I’ve written a novel here, haven’t I. Maybe I’ll take some of this info and put it in a future post. THank YOU for posting your RDD HOly Grail recipe!! !!!!! !I couldn’t even find success making just regular crusts with generic recipes I found online. After eating Lou Malnati’s in Chicago and trying Angelo’s in Cleveland, I really wanted to make some deep dish. After googling recipes with those names I found your site. AND it was the best pizza I ever made!! I added cooked panko bread crumbs to the bottom, since I really like the way Angelos does that and 1/2 teaspoon of baking powder. Thanks for sharing your deep dish pizza knowledge with us!!!! Just wanted to let you know that I had great success with your deep dish recipe 12-28-12. I have been attempting to replicate a Malnati type pie for several years and have researched a ton of recipe’s. Overall – nice recipe and very detailed instructions. Glad to hear you had good results! I do something similar with your ‘reflected heat’ setup, but I just use a big sheet of heavy duty aluminum foil for the top rack at the highest level. It not only reflects heat from the bottom, but deflects heat from the top burners to reduce the chance of the top burning before the rest of the pizza has cooked.